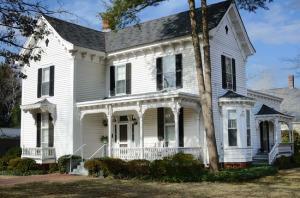 When you think of a "historic" home, you might think of a grand home from the Victorian era that's over 100 years old. However, maintaining the historic charm of a home is a worthwhile project even if your home is a Midcentury house with a less impressive pedigree. You've got an extraordinary number of options for new doors and windows today. Your choice will not only be influenced by the cool features of today's options, but it may also require some decisions made about the historic charm and character of your residence. You'll want to identify the architectural style of your home, which may require finding out about when it was constructed, as well as the design standards in use during that period. Tip: If your home is many decades old, previous owners may have made renovations that concealed the original details of the house. If your home was constructed over 100 years ago, you might be able to visit the local historical society (if one exists) to learn about some of the well-known and historic residences in the area. At the very least, research into the era when your home was constructed will offer details on architectural and design standards of the day. Your home may even subscribe to multiple styles, which means you might need to think about going in a specific direction with your renovations and replacements. Perhaps your home was a traditional ranch-style house, but recent renovations put a contemporary stamp upon the facade. You can choose to roll back the modern features and choose windows and doors that would look appropriate on your home's original architecture. Or, you can go in the other direction by making the home updated to a contemporary style. Fiberglass windows are a great way to retain the style of classic wood windows without having to deal with the maintenance and upkeep of wood. Although wood is a classic, beautiful choice for replacement windows, there are better options today. Also, today's vinyl windows might seem a little out-of-sync with a historic home. So, considering fiberglass is a great way to use a modern, maintenance-free material while staying true to the home's original architecture. In addition to the superior longevity of fiberglass with its resistance to warping, cracking, and general wear, it's also possible to significantly enhance the energy efficiency of your home while retaining its historic charm. On the green front, some manufacturers fill the hollow fiberglass frames with foam insulation to enhance the product's thermal performance. In addition, fiberglass is relatively easy to fabricate, so fiberglass products have a low embedded energy, meaning they don't require a lot of energy to produce. The National Park Service suggests that upgrading windows may improve energy efficiency but that old windows aren't necessarily the incredible energy sink most people assume. The best choice for sustainability may be to repair historic windows instead of fully replacing them. The sustainable choice is to repair historic windows whenever possible. The reason repairing historic windows is often the most sustainable option is because the amount of new materials needed to repair windows is much lower than the materials used to fully replace windows. For homeowners who want to improve energy efficiency of existing windows, the government suggests taking a look at installing storm windows. Windows, whether historic or new, are a source of heat loss because they are a poor thermal barrier compared to solid walls. Adding storm windows can improve the thermal efficiency of any window. If a building has existing storm windows, ensure they are tight fitting and in good working condition.